Mayor Drs. Markus Jacob Papilaja, M.S. Ambon (Indonesian: Kota Ambon, Dutch: Amboina ; Portuguese: Nossa Senhora de Anunicada ; Spanish: Ciudad de Amboina) (2010 pop. 330,335) is the main city and seaport of Ambon Island, and is the capital of Maluku province of Indonesia. This city is also known as "Ambon Manise," which means "beautiful" or "pretty". Ambon is the largest city in the Maluku islands and is the central of Maluku archipelago. Today, the city of Ambon has become the center of the port, tourism and education in the Maluku islands. 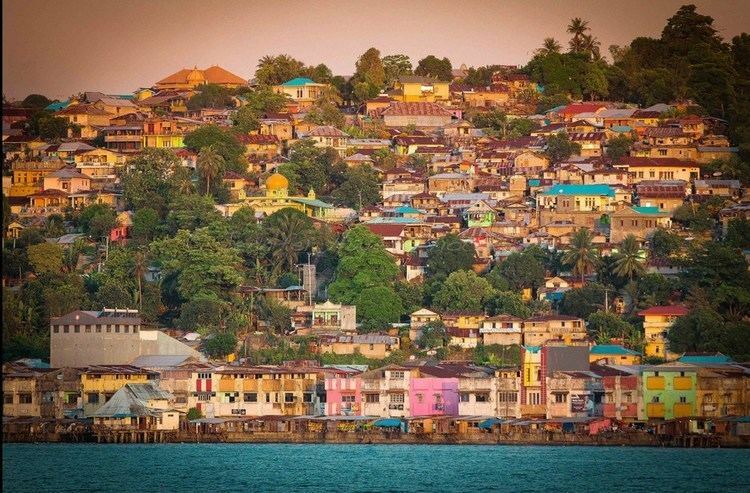 The city of Ambon is a portrait of a pluralistic city. Where the inhabitants come from ethnic Alifuru (original Moluccas), Javanese, Balinese, Butonese, Bugis, Makassar, Papuan, Minahasa, Minang, Flobamora (Flores, Sumba, Alor and Timor tribes) and those of foreign descent (Chinese Community, Arabian-Ambonese Community, Spanish-Ambonese Community, German-Ambonese Community, Portuguese-Ambonese Community and Dutch-Ambonese Community). Ambon was colonized by Portugal in 1526 and originally named Nossa Senhora de Anunciada, founded by Portuguese-Moluccan Governor Sancho de Vasconcelos. The Portuguese were driven out by the Dutch in 1609. Except for brief periods of British rule, the island remained under Dutch control until Indonesia's independence in 1945. During the Dutch period, Ambon was the seat of the Dutch resident and military commander of the Maluku Islands. The town was protected by Fort Victoria, and a 1911 Encyclopædia characterized it as "a clean little town with wide streets, well planted". The population was divided into two classes, orang burger (citizens) and orang negri (villagers), the former being a class of native origin enjoying certain privileges conferred on their ancestors by the old Dutch East India Company. There were also, besides the Dutch, some Arabs, Chinese and a few Portuguese settlers. On 22 December 1902, the Apostolic Prefecture of Dutch New Guinea was established in the city, later to be promoted as the Diocese of Amboina. Ambon Island was the site of a major Dutch naval base, captured by the Japanese in 1942. Ambon was a center of Christian missionary activity, and Ambon and the surrounding islands have many Christians as well as the Muslims that predominate in most of Indonesia. In 1950 Ambon was the center of an uprising against Indonesian rule, caused by the rebellion of Republic of the South Moluccas. Most of the people were loyal to the RMS movement. Indonesian troops invaded the city and reasserted control just in few months. Many important buildings such as the Victoria Fort (APRMS main base) were heavily damaged during the confrontation. In April and May 1958 during the Permesta rebellion in North Sulawesi, the USA supported and supplied the rebels. Pilots from a Taiwan-based CIA front organisation, Civil Air Transport, flying CIA B-26 Invader aircraft, repeatedly bombed and machine-gunned targets in and around Ambon. On 27 April a CIA raid set fire to a military command post, a fuel dump and a Royal Dutch Shell complex. The attack on Shell was deliberate: the CIA had orders to hit foreign commercial interests in order to drive foreign trade away from Indonesia and undermine its economy. The next day, the same CIA pilot bombed Shell interests at Balikpapan in East Kalimantan on Borneo, which persuaded Shell to suspend tanker services from there. On 28 April a CIA air raid damaged an Indonesian Army barracks next to a marketplace. On 30 April a CIA air raid hit the airstrip. On 7 May a CIA air raid attacked Ambon airstrip, seriously damaging a Douglas C-47 Skytrain and an Indonesian Air Force North American P-51 Mustang and setting fire to a number of fuel drums. On 8 May a CIA B-26 tried to bomb an Indonesian Navy gunboat in Ambon harbour. Its bomb missed but it then machine-gunned the boat, wounding two crew. The Indonesian National Armed Forces reinforced Ambon City's anti-aircraft defences with a number of 12.7 mm (0.5 in) machine guns. On 9 May a CIA B-26 attacked the city again. The machine-gunners returned fire and an Indonesian Air Force P-51 Mustang chased the B-26, but it escaped. On 15 May a CIA B-26 attacked a small ship, the Naiko, in Ambon Bay. Naiko was merchant ship that the Indonesian Government had pressed into military service, and she was bringing a company of Ambonese troops home from East Java. A CIA bomb hit the Naiko's engine room, killing one crew member and 16 infantrymen and setting the ship on fire. The B-26 then attacked Ambon city, aiming for the barracks. Its first bomb missed and exploded in a market-place next door. The next landed in the barracks compound but bounced and exploded near an ice factory. The B-26 in the May air raids was flown by a CAT pilot called Allen Pope. On 18 May Pope attacked Ambon again. First he raided the airstrip again, destroying the C-47 and P-51 that he had damaged on 7 May. Then he flew west of the city and tried to attack one of a pair of troop ships being escorted by the Indonesian Navy. Indonesian forces shot down the B-26 but Pope and his Indonesian radio operator survived and were captured. Pope's capture immediately exposed the level of CIA support for the Permesta rebellion. Embarrassed, the Eisenhower administration quickly ended CIA support for Permesta and withdrew its agents and remaining aircraft from the conflict. As part of the transmigration program in the 1980s, the Suharto government relocated many migrants, most of them Muslim, from densely overpopulated Java. Between 1999 and 2002, Ambon was at the centre of sectarian conflict across the Maluku Islands. There was further religious violence in 2011.
relatively flat topography, it lies in the area along the coast with the radius between 0–300 meters from the shoreline. sloping ramps topography (100 meters towards mainland). steep hills topography lies in the hills. Ambon experiences tropical rainforest climate (Af) according to Köppen Climate Classification as there's no real dry season. The driest month is November with precipitation total 114 millimetres (4.5 in), while the wettest month is June with precipitation total 638 millimetres (25.1 in). The abundance precipitation seems to be influenced by the monsoon. As its location near the equator, the temperature throughout the year seems constant with no significant difference. The hottest month is December with average temperature 27.2 °C (81.0 °F), while the coolest month is July with average temperature 25.0 °C (77.0 °F). The city is divided into five districts (kecamatan), tabulated below with their 2010 Census population. Based on Sensus 2010, the city populated by 331,254 people. In 2010, the number of religion adherents in Ambon was 58.37% Protestant, 39.02% Islam, 2.41% Catholic, and other account for 3%. 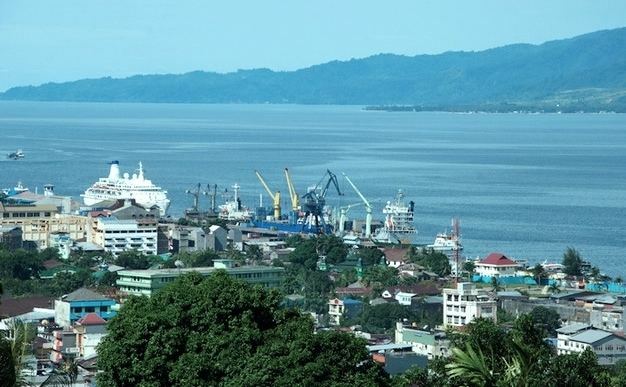 Economic growth rate of Ambon City in 2014 is 5,96%. Gross Domestic Regional Product of Ambon in 2014 both at current market price and at constant market price was increasing gradually. The increase, if compared to 2013 GDRP at current market price equal to 12.76 percent and 5.96 percent for GDRP at constant market price. The value of GDRP at current market price in Ambon 2014 is equal to Rp.9.9 trillion, whereas for GDRP at constant 2010 market price is equal to Rp.7.77 trillion. In 2014, the Gross Domestic Product per capita of Ambon based on current prices grew by 8.3 percent, while for the constant price in Ambon City grew by 1.7 percent. GDP per capita of Ambon City in 2014 is 25.16 Million (U $1,836.43). The poverty rate in the city of Ambon is 4.42% which is the smallest percentage of poverty in the province of Maluku. All twenty one economic sectors in 2014 got positive growths for GDRP of Ambon. For GDRP at current market price, highest growth given by Electricity and Gas Sector with 34.2 percent, whereas the lowest was Human Health and Social Work Activities Sector with 6.61 percent. For GDRP at constant market price, highest growth given by Electricity and Gas Sector (30.54%) and the lowest was Human Health and Social Work Activities Sector (2.12%). The literacy rate was 99.63% in 2010. Unlike the literacy rate, school enrollment rate in Ambon City showed a negative trend (that is 73% in 2010, whereas the national average reached 96%). In 2010, the enrollment rates in Ambon City are 98.72% in the primary education level, 95% in junior high, 78% in high school, and 45% in college or university.